Ray Sher led a conversation about Foodscaping our homes, followed by some basics of healthy soil. Ray shared pictures of attractive planted beds planted with attractive arrangements of plants, some of which were food, some of which could just as easily been food. Many were mixed edible & ornamental plants. And one was a beautiful foundation bed at Ray’s home consisting entirely of edibles–pansies, nasturtiums, chards, & tall dill in the back. Nasturtium has a peppery taste & both flowers & foliage are edible. Pansies are pretty bland. They are often candied with sugar & used for cake decorating. 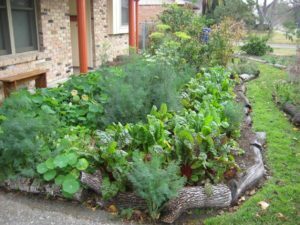 We then discussed attractive edible plants for use in these beds, focusing on our winter season crops which consist primarily of some very attractive leafy greens. Cabbages, chards, kales, lettuces, bok choys, beets and the like have lush lovely foliage and pleasing shapes. And they come in reds, purples, yellows, oranges & white, solid and speckled. Deep dark red Ruby Streaks Mustard and Bulls Blood Beets. Bright red, orange and yellow rainbow chard. White stalked bok choy and white bulbed kohlrabi. Red Russian which is really purple if you ask me. Purple Kohrabi has very pretty purple veined foliage that stands taller than most other winter greens giving you a height option. Pea vines are also attractive. Winter herbs with lovely foliage include chamomile and tall, frilly dill and fennel. Ray also showed lovely espaliered fruit trees. This a very old traditional pruning method usually done to save space or let light through for other plants. This is frequently done to allow the fruit trees to grow flat against a wall or fence. There are espaliered fruit trees at the Hermann Park Centennial Gardens. Next was a picture of a solid hedge of citrus trees with their lovely dark glossy leaves. Ray said citrus can be crowded together and pruned for height or anyway you want and will still produce just fine. So if you want a privacy hedge, why not make it a citrus hedge? Many fruit trees, especially stone fruit like peaches & plums are beautiful in the spring when they are covered in blossoms. Citrus blossoms appear later & have a wonderful fragrance. Ray cautioned that it’s difficult to have everything in your garden looking beautiful all the time. You will probably need to pull out many plants early before they reach their ugly stage–Tomatoes, peppers, summer vining plants like cucumbers, squashes, beans. When sweet potato vines begin to turn ugly it’s a good signal that you can begin digging them up. Tip: You can buy seed blends such as salad & braising mixes that include a variety of colorful foliage with little effort. Just scatter the seeds on your prepared bet, water gently. Most of these will sprout & grow quickly. Another tip: Invest $, creativity or effort into attractive trellises & supports. Last November, Ray told us about good fruit tree & shrub varieties for the Houston area. And techniques for their planting & care in our special soil & climate conditions. See a recap of that talk here. And don’t forget the Urban Harvest Fruit Tree sale is coming up in mid-January. They will hold many talks and other events, free & otherwise, in the weeks leading up to the sale. Visit urbanharvest.org for a list of events. 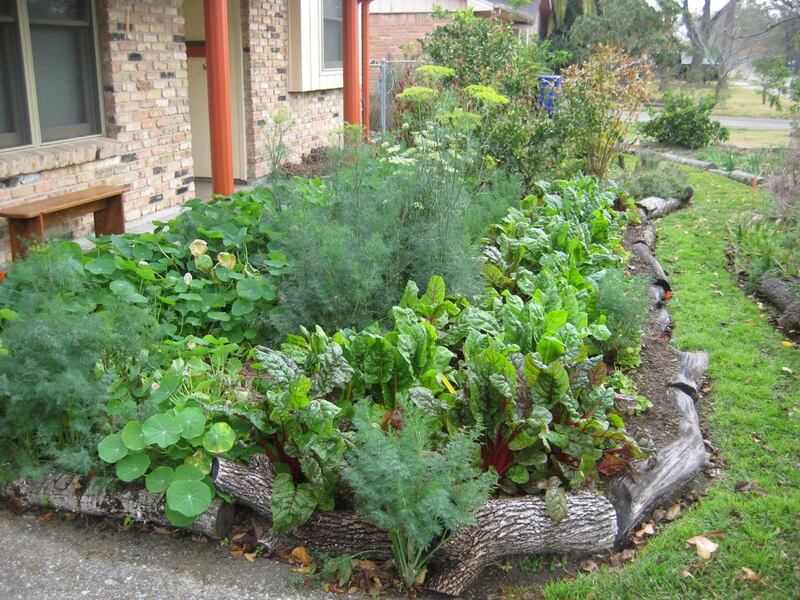 Ray Sher is a gardening and permaculture instructor, vegetable and fruit garden consultant, and works his large intensive home vegetable, fruit and herb garden using organic methods. He frequently writes for the Urban Harvest column in the Houston Chronicle. Contact him at RayInTheGarden@sbcglobal.net.